You are faced with a plate of scones, a pat of butter, a dish of jam and a pot of clotted cream. [...] You have either butter or cream, never both. At least not when everyone is looking. It is generally accepted that the jam goes on first, followed by a teaspoonful of cream. Others insist it is the other way round. -Nigel Slater, "Eating for England"
And we suddenly neeeeeeded to have scones. Luckily for us, not everyone was looking: we had all three condiments on our scones. Butter first, next cream - maybe more than a tablespoon, THEN jam. Mmmmmm!!! 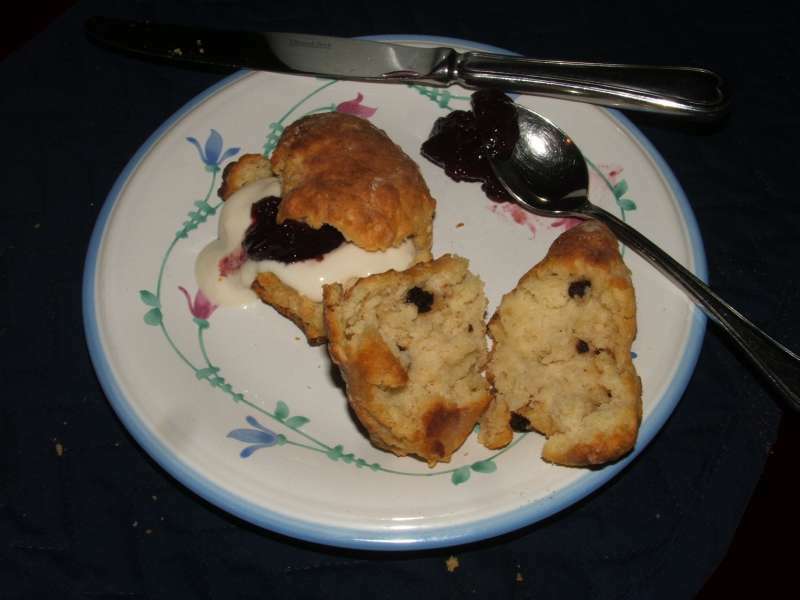 Scones with butter, "cream" (made with yoghurt and goat's cheese) and black currant jam. What could be finer? 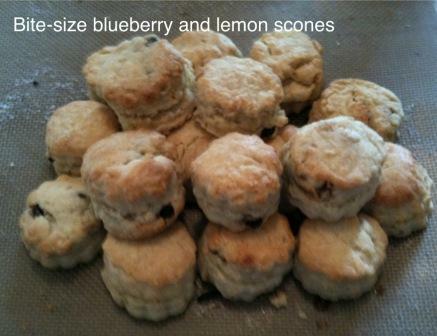 The scones want to split in half; the crumb is very tender. The hint of nutmeg and addition of currants differentiates scones from our baking powder biscuits. needs nothing else apart from a small pat of butter, in my very humble opinion. I've lived on several continents and islands for extended periods. 'Scones' or American 'biscuits' seem to be ubiquitous items worldwide...they DO vary a lot, however. The ones that sit around all day in bakeries are really British 'rock (buns) cakes', with raisins or cranberries, or even chocolate chips and macadamia nuts.) NOT real scones, in other words. For fresh, hot, British-style scones, I'd say: if there's no Jersey butter, then jam and cream (in that order) make a fine substitute...that's just ONE opinion, though. Macadamia nuts? Oh my no. Elizabeth...I'm in Canada too...Hamilton ON. I've found the President's Choice butter in the sticks very good and better for baking imho over the other 1 lb/54 g blocks. I haven't tried their special butters because they only sell them in 225 g blocks and the cost is prohibitve. I also make fake clotted cream. I use a couple of tablespoons of active organic yogurt such as the Liberte brand available at Loblaws/nofrills and mix it into 1 cup of whipping cream (heavy cream) and let it sit out over night covered with a dishtowel. Thickens up like commercial sour cream and is very tasty. We've done something similar to make fake creme fraiche using cream cheese and 10% cream. But on this particular day that we had scones, we didn't have any cream in the house and so divised the one with goat's cheese and yoghurt. While it doesn't taste like clotted cream when eaten on its own, it does work very well when combined with jam on scones. I'd be hard-pressed to say that it wasn't clotted cream. River Cottage is a good show, isn't it? We also like Hugh Fearnley Whittingstall's River Cottage cookbook. I'm surprised he puts an egg in his scones though. And nooooo!! 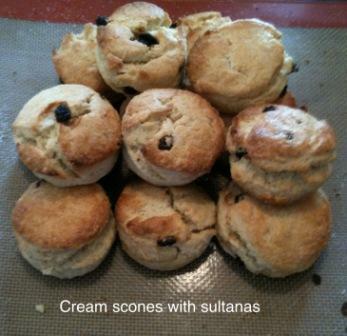 Don't adulterate your scones with sultanas; sultanas are horrible in scones! ;-) Use currants or Thompson raisins instead. By the way, plain scones with just butter are fabulous. P.S. And while I'm on this purist thread, I've never seen scones shaped with a cookie cutter either. In my experience, they're always cut into triangles or diamonds with knife. 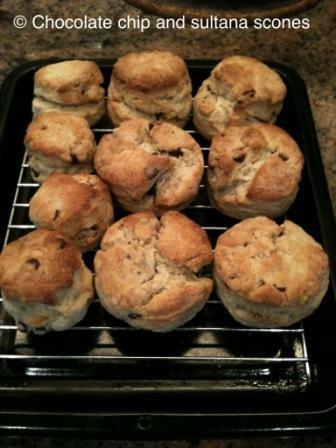 I was taught to make scones with raisins when I was at school more than 40 yrs ago. (raisins, currants, sultanas or whatever, they all taste the same to me anyway). They should be eaten plain with clotted cream and jam but since I don't have clotted jam, I thought I would just add a little extra ingredients. I've only known them to be round and cut out with a cookie cutter (you can of course shape them by hand, i just didn't want to handle the dough to much for fear of melting the fat. FYI, the typical scones in Somerset (where I worked one esummer in 1972) and served with clotted cream and strawberry jam are also round. Do try the fake cream if you get a chance. It's really delicious. Not exactly like clotted cream but darn close. Thanks for the tip on fake clotted cream. When you refer to cream chesse do you use Philadelphia cream cheese or do you use Marscapone cheese which tastes almost like cream? And the whipping cream is pouring consistency, not whipped, correct? Mascarpone would certainly work, but it's quite pricey. We use something similar to Philadelphia cream cheese. And yes, pouring consistency for the cream, not whipped. You can use 35%, 18%, 10% cream and get pretty much the same results. is something I have missed in life..drat! Looking at Wikipedia it looks thick and creamy like soft butter. The picture above looks more like a sour cream consistency. How is it truly? By the way, all look yummy! And yes, it tastes really good. Not quite like clotted cream but with jam and scone, it's a not unreasonable facsimile. to die for.. good thing I haven't access to it readily. I would be in much more trouble than I am!